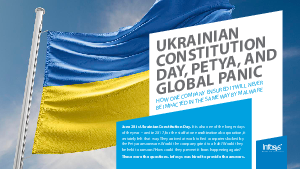 June 28 is Ukrainian Constitution Day. It is also one of the longer days of the year - and in 2017, for the staff at one multinational corporation, it certainly felt that way. They arrived at work to find computers locked by the Petya ransomware. Would the company grind to a halt? Would they be held to ransom? How could they prevent it from happening again? These were the questions. Infosys was hired to provide the answers.